Falcons wideout Julio Jones (2,737 career yards, 20 TDs) has notched double-digit targets and/or one touchdown in his last seven games. 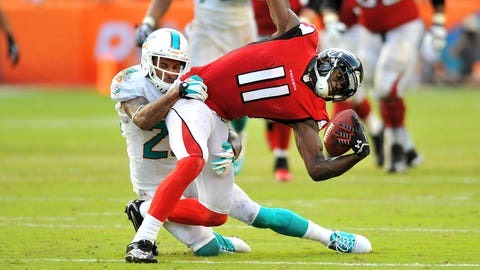 In a surprise to few observers on Tuesday, the Atlanta Falcons exercised their fifth-year option on receiver Julio Jones’ contract. Jones, 25, one of the NFL’s most prolific young receivers before suffering a season-ending foot injury last October, will make approximately $10.18 million in 2015. In 2013, a truncated season for the third-year receiever, Jones tallied 41 catches, 580 yards and two touchdowns. Jones (2,737 yards receiving, 20 TDs) could hit free agency as soon as March 2016, but the Falcons would also hold the option of franchising the Alabama product — absent of a long-term deal between the parties.